Cognitive Behavioral Therapy (ABC Model) could be described as “as I think, so I feel (and do)!” (The link is to Learning cognitive-behavior therapy: an illustrated guide By Jesse H. Wright, Monica Ramirez Basco, Michael E. Thase.) 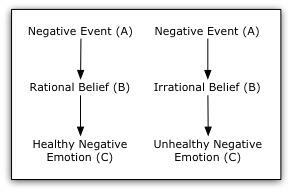 Understanding it is as simple as A B C.
In the charts above and below (from counselingresource.com) you can see how that when a negative event happens, one can interpret it positively or negatively. How one interprets it affects how one feels, thinks and behaves. "The stronger person is not the one making the most noise but the one who can quietly direct the conversation toward defining and solving problems." A - Mary is walking down the street, and her friend Sarah walks right on by. C – Next time, Mary ignores Sarah. The “B” may or may not be true. Here is another possibility. C – Mary calls out, Sarah apologizes for missing her, and they go for coffee! 1. Black-and-White - Thinking or either / or thinking. 3. Filtering – honing in on the negative, forgetting the positive. 8. Confusing Fact with Feeling – “If I think or feel this way then my thoughts/feelings must be correct'. 9. Labelling – I’m a loser vs. I made a mistake. In Sample Session Five, counselor Joan took a more direct approach with client Mary. Joan has the luxury of being able to confront Mary – to "take the gloves off" regarding Mary’s treatment of her own self – and know that if the client doesn’t agree, she can vote with her feet. Friends and partners can’t do that. Cognitive Behavioral Therapy or any kind of professional and/or compassionate counseling is not about pretending problems don't exist. Rather, it’s about being more accurate about strengths and resources and enlisting these to make the changes necessary to live a good life on a number of levels.